I have said this before and I will say it again: One of the things I really love about horticulture is that even after the 25 short years that I’ve been in the business, the excitement of coming across a new plant never tires. In 2011, I had the pleasure of visiting Thompson and Morgan trials while on a garden tour in England. I was immediately drawn to what appeared to be a foxglove with blooms that were uniquely shaped and had an eye-catching colour combination. I couldn’t help but notice that bees were rather busy visiting each open flower. Upon closer inspection, I found a label that read Digiplexis. What is that? 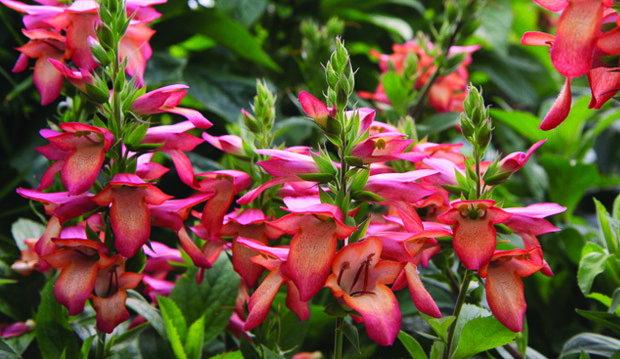 I recall emailing Sandra (TBG’s head gardener) and Aldona (our executive director at the time) that evening about this plant, which I just had to try and grow. I soon learned that Digiplexis is the result of a successful cross between Digitalis purpurea (foxglove) and Isoplexis canariensis (Canary Island foxglove). Three years later, and with much thanks to one of Ontario’s finest wholesale growers, Maple Leaf Nurseries, Digiplexis was available at this year’s plant sale in May. For additional information about this recent introduction, click here. A couple of weeks ago, our friends in the perennial department at Plant World alerted me to a new plant they just received. Eriogonum allenii ‘Little rascal’. Although the species rang a bell, I needed to learn more. According to the Jilleto seeds (a wonderful source of all sorts of amazing treasure) Eriogonum, commonly known Shale Barren Buckwheat is a Western American native perennial that is reported to be hardy to zone 5. 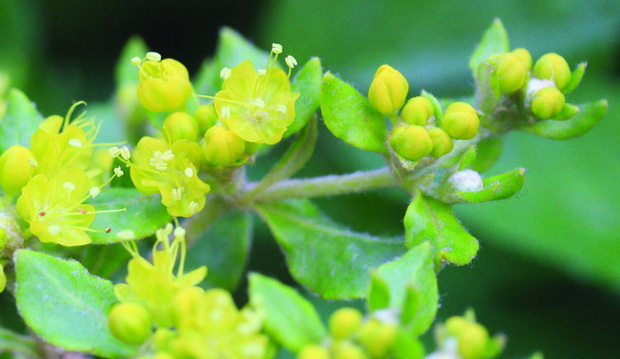 It’s said to be drought tolerant, long blooming and a great perennial for supporting foraging bees. I was also drawn to the grey-green foliage at the base of the plant. There’s no better way to learn more about a plant than to grow it. 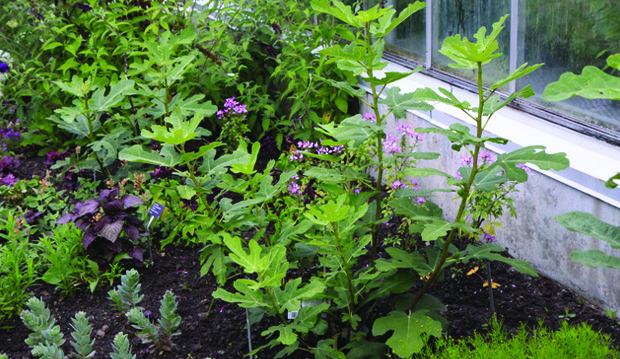 We have since planted five specimens in the President’s Choice Show Garden. We’ll be watching the plants and evaluating their performance over the next few months. Be sure to have a look the next time you are visiting the gardens. 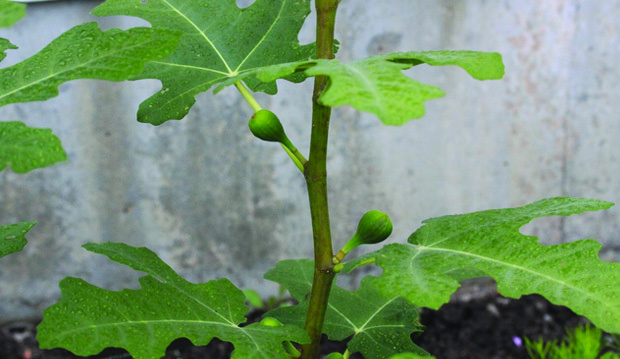 While in the show garden, be sure not to miss the three hardy figs (Ficus carica) planted on the south side of the city greenhouse. Despite the incredibly cold and long winter, all three specimens survived. Each died back completely to ground level. All of the growth visible is new growth from this year. Be sure to have a close look; yes, they’re also fruiting. Fingers crossed that we will have a few figs to donate to the North York Harvest Food Bank along with other produce harvested from the Teaching Garden, Kitchen Garden and Demonstration Courtyard. No sampling please.